Until recently, if you were on the hunt for a new home, you typically had two options. In the first scenario, you could come up with a list of your needs and wants and then try to find a home that already exists in the area you desire. In the second scenario, you could have a company custom-design your home and construct it from the ground up. With the introduction of modular homes to the market, however, prospective homebuyers no longer need to choose one option or the other. While there are benefits to buying an existing home or constructing your own from scratch, there are also inevitable drawbacks. Chances are, for example, that you will need to make some sacrifices if you are trying to find your entire “wish list” in an existing home in your target area. There are drawbacks, too, that come with constructing your own home from scratch, as construction costs alone can wind up eating up a major portion of your budget. Modular homes, however, offer the best of both worlds. First, you can customize virtually every detail of your home to make it uniquely fit your needs, and second, much of the construction has happened by the time your home arrives to your build site, shortening construction times and lowering related expenditures. 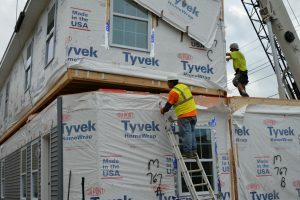 Prefabricated homes have been making their way into the national construction scene for some time now, but they have become increasingly popular due to their design techniques. Many traditional homebuilders are now relying on some of the systems and construction methods first introduced by modular house builders. Glue guns and nail guns, for example, have largely taken the place of traditional hammers and nails, and this is a move that began in modular house construction before making its way mainstream. The needs of today’s homebuyers are constantly changing, and modular homes offer the easy customization necessary to accommodate these evolving needs. If you are among those seeking a new place to live that will fit with your lifestyle, know that these premanufactured homes are redefining today’s construction industry.